FILE - Christopher Stokes, the general director of medical charity Doctors Without Borders, stands at the gate of the organization's hospital, after it was hit by a U.S. airstrike, in Kunduz, Afghanistan, Oct. 15, 2015. 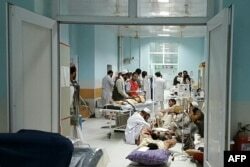 Doctors Without Borders said the death toll from the mistaken half-hour aerial attack on its hospital by U.S. forces in Kunduz in October has risen to 42. Previous reports had the death toll at 30. The international charity, also known by its French acronym MSF, said the revised figures include 14 MSF staff, 24 patients and four caretakers. The caretakers were relatives providing additional nursing for patients. "Determining the death toll has been extremely difficult in the chaos of the facility's wreckage," MSF said Saturday in a statement. "Part of the medical archives, patient files and admission sheets were destroyed. ... As well, additional human remains had been found in the hospital rubble over the course of the past two months," MSF said. The group also conducted interviews with MSF staff, patients and family members, and cross-checked information with other hospitals in Afghanistan where MSF patients were transferred. American forces misidentified a target in Kunduz, Afghanistan on October 3 that resulted in the attack on the MSF hospital, according to a U.S. military investigation. Army Gen. John Campbell, the commander of U.S. and international forces in Afghanistan, said Afghan forces asked for U.S. air support to strike a National Directorate of Security building believed to be occupied by Taliban fighters. According to the report, the AC-130 air crew instead fired 211 shells at a hospital operated by MSF that was 450 meters away. "This was a tragic mistake," Campbell said last month. "This is an example of human and process error. It was directly the result of avoidable human error." Several factors contributed to the mistake, he said. The air crew launched more than an hour earlier than planned, missing out on a crucial brief that would normally include identifying no-strike areas such as the MSF hospital. Once in flight, the aircraft's electronic systems malfunctioned, eliminating the crew's ability to transmit video, send and receive email, or send and receive electronic messages. The crew then believed it was the target of a missile, Campbell told reporters, so they moved out of the aircraft's normal strike range, degrading the accuracy of the targeting system. That loss of accuracy appeared to cause the coordinates of the Taliban target to land on an open field. The crew visually located the "closest, largest" building to that field and, thinking that was the target, fired on it. Campbell said some military personnel involved in the incident have been suspended from duties pending possible disciplinary action, and that the U.S. intends to assist MSF in rebuilding the hospital. "Some individuals did not follow the rules of engagement," Campbell's spokesman, Brig. Gen. Wilson Shoffner said recently. When asked whether the proportionality of the attack was justifiable under international law, Shoffner said the "actions of the air crew were not appropriate to the threats they faced." "No nation does more to prevent civilian casualties than the United States, but we failed to meet our own high expectations on October 3," Campbell said. FILE - In this undated photograph released by Doctors Without Borders (MSF) on October 3, 2015, Afghan MSF medical personnel treat civilians injured following an offensive against Taliban militants by Afghan and coalition forces at the MSF hospital in Kunduz. Afghan President Ashraf Ghani said the conclusions reached by the U.S. were in line with the findings in a separate NATO probe. MSF said the errors pinpointed in the U.S. report showed "gross negligence" on the part of U.S. forces, and it renewed its call for an outside, independent investigation. "It is shocking that an attack can be carried out when U.S. forces have neither eyes on a target nor access to a no-strike list, and have malfunctioning communications systems," the charity said. Days before the attack, MSF had provided geographic coordinates of its hospital to U.S. military authorities. The barrage on the hospital lasted 29 minutes before commanders realized the mistake, even as hospital staff members made 18 attempts to call or text U.S. and Afghan authorities about the attack as it was occurring. "The personnel who requested the strike and those who executed it from the air did not undertake appropriate measures to verify that the facility was a legitimate military target," Campbell said. FILE - Doctors Without Borders Staff in shock in part of the international medical charity's hospital in Kunduz, Afghanistan, that wasn't destroyed by an apparent airstrike, Oct. 3, 2015. Many of the doctors and nurses at the hospital were killed instantly, and some patients who could not be moved to safety died in the ensuing flames from the attack. At least another 37 people were injured, with investigators concluding there likely were still other casualties. It was one of the worst incidents of civilian casualties during the 14 years the U.S. has been involved in military actions in Afghanistan, which stemmed originally from the 2001 al-Qaida terrorist attacks on the United States that killed nearly 3,000 people. Within days of the October 3 incident, President Barack Obama called Joanne Liu, the president of Doctors Without Borders, to apologize for the mistaken attack and pledge that a full investigation would be conducted.